Name of an angel found only in Jewish literature. Elisha b. Abuyah, seeing this angel in the heavens, believed there were "two powers" or divinities (Ḥag. 15a, above). When God wept over the destruction of the Temple, Meṭaṭron fell on his face and said: "I will weep; but weep not Thou." God answered and said: "If thou wilt not suffer Me to weep, I will go whither thou canst not come, and there will I lament" (Lam. R., Introduction, § 24; comp. Jer. xiii. 17). Meṭaṭron bears the Tetragrammaton; for Ex. xxiii. 21 says, "My name is in him." Yet he may not be worshiped; for the same passage says, "Exchange Me not for him" (dialogue between a heretic and a Babylonian teacher, in Sanh. 38b, below; Targ. Yer. to Ex. xxiv. 1 has Michael instead of Meṭaṭron). Moses begs Meṭaṭron to intercede with God for him, that he may not die; but the angel answers: "It is useless; for I heard the words behind the veil, 'Thy prayer will not be answered'" (both editions of Tan., Wa'etḥanan, 6). When God sorrowed for the death of Moses, Meṭaṭron fell down before Him and consoled Him (Grünhut, "Liḳḳuṭim," v. 105a), and when Moses died, this angel with three others, "the princes of wisdom," cared for him (Targ. Yer. to Deut. xxxiv. 6). The early commentators with good reason identified the prince of the world (Ḥul. 60a; Zeb. 16b; Sanh. 94a) with Meṭaṭron (Joël, "Blicke in die Religionsgesch." i. 124 et seq.). God instructs children in the Torah during the last quarter of the day; Meṭaṭron, during the first three-quarters ('Ab. Zarah 3b). It was this angel who caused Shamḥazai to say before the Flood, "God will destroy the world" (Yalḳ. i., § 44). He is, moreover, Enoch, the great scribe (Targ. Yer. to Gen. v. 24; in Ḥag. 15a he is likewise represented as a scribe). These statements, found in the earlier sources, contain all the characteristic traits ascribed to Meṭaṭron in the later mystical works. The latter call him the "prince of the presence" (Jellinek, "B. H." ii., pp. xvi., 55 et seq., v. 171; "Responsen der Gaonen," ed. Harkavy, No. 373, p. 372; comp. Isa. lxiii. 9), and "prince of the ministering angels" (Jellinek, l.c. v. 172). He is the "mighty scribe" (ib. ii. 68), the lord of all the heavenly hosts, of all treasures, and of secrets (ib. ii. 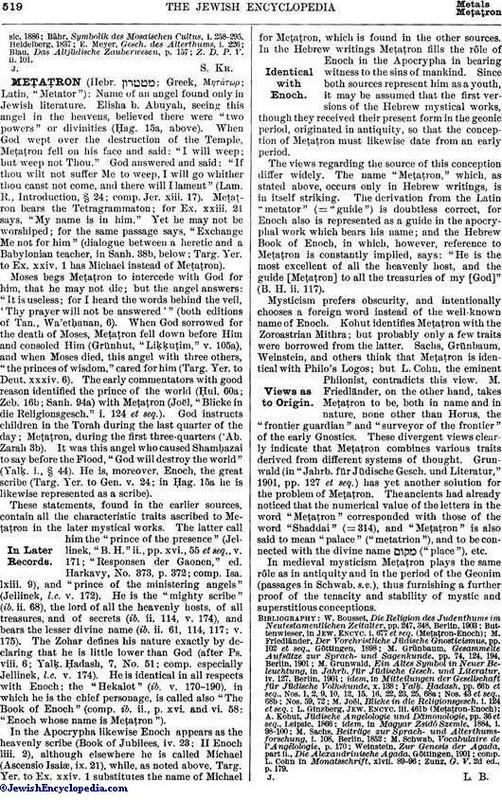 114, v. 174), and bears the lesser divine name (ib. ii. 61, 114, 117; v. 175). The Zohar defines his nature exactly by declaring that he is little lower than God (after Ps. viii. 6; Yalḳ. Ḥadash, 7, No. 51; comp. especially Jellinek, l.c. v. 174). He is identical in all respects with Enoch; the "Hekalot" (ib. v. 170-190), in which he is the chief personage, is called also "The Book of Enoch" (comp. ib. ii., p. xvi. and vi. 58: "Enoch whose name is Meṭaṭron"). In the Apocrypha likewise Enoch appears as the heavenly scribe (Book of Jubilees, iv. 23; II Enoch liii. 2), although elsewhere he is called Michael (Ascensio Isaiæ, ix. 21), while, as noted above, Targ. Yer. to Ex. xxiv. 1 substitutes the name of Michael for Meṭaṭron, which is found in the other sources. In the Hebrew writings Meṭaṭron fills the rôle of Enoch in the Apocrypha in bearing witness to the sins of mankind. Since both sources represent him as a youth, it may be assumed that the first versions of the Hebrew mystical works, though they received their present form in the geonic period, originated in antiquity, so that the conception of Meṭaṭron must likewise date from an early period. The views regarding the source of this conception differ widely. The name "Meṭaṭron," which, as stated above, occurs only in Hebrew writings, is in itself striking. The derivation from the Latin "metator" (="guide") is doubtless correct, for Enoch also is represented as a guide in the apocryphal work which bears his name; and the Hebrew Book of Enoch, in which, however, reference to Meṭaṭron is constantly implied, says: "He is the most excellent of all the heavenly host, and the guide [Meṭaṭron] to all the treasuries of my [God]" (B. H. ii. 117). Mysticism prefers obscurity, and intentionally chooses a foreign word instead of the well-known name of Enoch. Kohut identifies Meṭaṭron with the Zoroastrian Mithra; but probably only a few traits were borrowed from the latter. Sachs, Grünbaum, Weinstein, and others think that Meṭaṭron is identical with Philo's Logos; but L. Cohn, the eminent Philonist, contradicts this view. M. Friedländer, on the other hand, takes Meṭaṭron to be, both in name and in nature, none other than Horus, the "frontier guardian" and "surveyor of the frontier" of the early Gnostics. These divergent views clearly indicate that Meṭaṭron combines various traits derived from different systems of thought. Grunwald (in "Jahrb. für Jüdische Gesch. und Literatur," 1901, pp. 127 et seq.) has yet another solution for the problem of Meṭaṭron. The ancients had already noticed that the numerical value of the letters in the word "Meṭaṭron" corresponded with those of the word "Shaddai" (= 314), and "Meṭaṭron" is also said to mean "palace" ("metatrion"), and to be connected with the divine name ("place"), etc. In medieval mysticism Meṭaṭron plays the same rôle as in antiquity and in the period of the Geonim (passages in Schwab, s.v. ), thus furnishing a further proof of the tenacity and stability of mystic and superstitious conceptions. Zunz, G. V. 2d ed., p. 179.